Kenneth Cole or His Publicist? If you’re unfamiliar with twitter it’s not unusual for a large brand to have more than one person tweeting on the account. What they do is then add their initials to the tweet so that you’ll see who sent it. 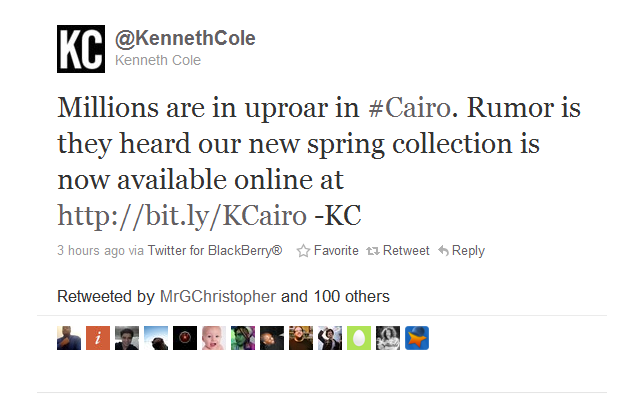 This morning this was on the @KennethCole account. Note that whomever posted this tweet had the foresight to customize the bit.ly link to read KCairo instead of the random string of characters bit.ly will create on it’s own. Is this from Kenneth Cole? A few hours later this anemic apology showed up. A few things are clear about this (in my mind). They don’t understand the power of twitter. 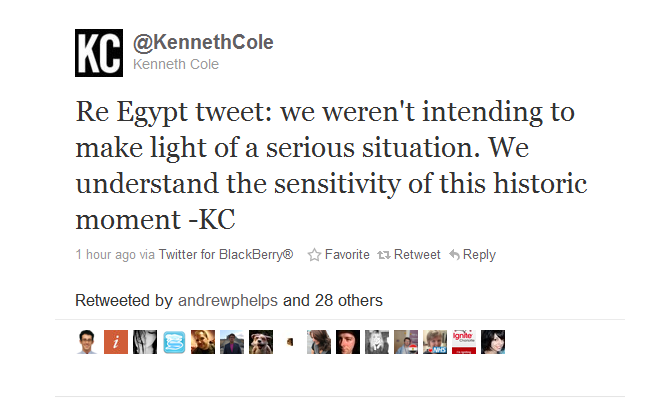 Twitter is being used right now by the Egytpians as a major communications tool in their uprising. Worldwide Digital Natives are creating open source software that allows the Egyptians access to the internet. This morning women are mourning the loss of their children who died because they dared demonstrate in hopes of a freer Egypt. This evening more families will join those ranks. When people are dying for a chance to have freedom, real freedom, it’s the time to be reverent. It’s a moment for inflection, and to be proud of humanity. This is a time where every Digital Native should look at the country they are in and ask themselves what they can do to keep the Internet Open and Neutral. This is not a moment to sell mid range shoes. What are you prepared to do today to help ensure that the the Internet Stays Open? Net Neutrality matters. UPDATE: Ranker (of course) has a list of House Representatives who are against Net Neutrality. I’m asking each and every one of you to contact your representative in some capacity today. This is so unfortunate. It seems that he must not realize the extent of what is going on in Egypt and why it’s happening. Or maybe he does and doesn’t care because it doesn’t affect him. I just don’t understand how anyone in their right mind would think saying something like that, and sharing it with the world, is OK! Sadly it is not real surprising to see this. We live in a world of instant gratification where many people prefer not to be asked to think. It is easier to just jump on the bandwagon of whatever fad is trending at the moment. Very few people bother to try and educate themselves about the world and or the situations around them. I am very curious to see what happens in Egypt, but I am not real optimistic about democracy. They have never had it. If you look back over the last 90 years or so you will see that they have had two kings followed by Nasser, Sadat and Mubarak. Something along these lines, although not nearly as serious as Egypt, happened with @HomeDepot (the verified account) yesterday. They tweeted a racial type hashtag thing. And I RT’d it and said “wait, what?” and one of their social managers, cause they have “many” tweeted me back with an “oopsy, we have a lot of fantastic people… and that was a mistake”. I shot back at her with and she shot back at me with”we’re all human”. SERIOUSLY!? So I asked her what corporate would think about that. Her response was “I am at corporate, sorry if you were offended.” Of course the tweets were deleted, but they still exist in my account. I was livid and totally incensed at her blaze’ attitude. Yep, people make mistakes but when you are a “social manager” for a BIG company with many thousands of followers… YOU DON’T. And if you do, you don’t make a joke out of it. At least KC or the social manager made an apology. Sarah @HomeDepot deleted it and just plain covered it up. And we wonder why people hate Americans?